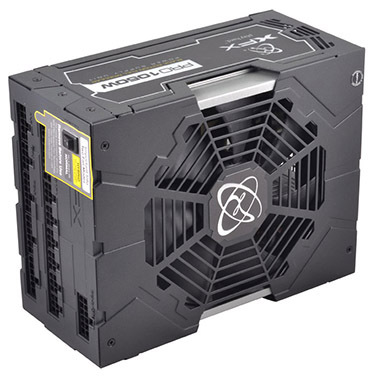 The PSU market is rife with supplies housing the very latest technology. Want a fully-modular supply with a zero-noise feature, sleek cabling, rock-solid performance and ripple suppression that wasn't commercially available 10 years ago? You can, and not just from one guy. Such knowledge means that anyone playing in the premium space really needs to be on their game. Better known for its slew of AMD-based graphics cards but having enjoyed an obvious presence in the PSU market for years, XFX believes it has the supplies to compete on a price-to-performance metric. 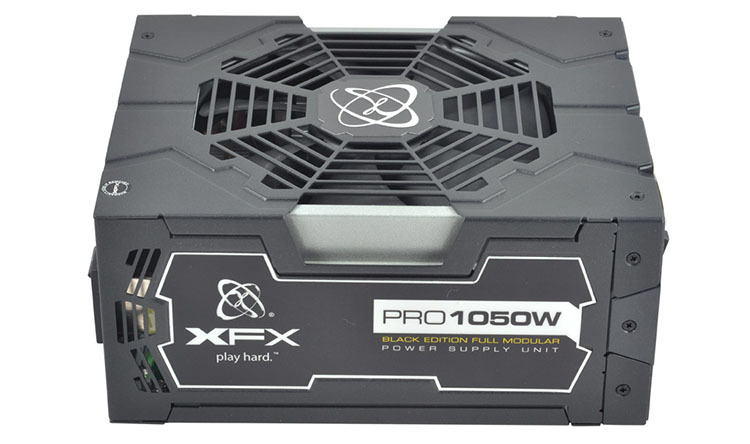 For those of you intent on running dual graphics cards and overclocking the CPU by a healthy margin it makes sense to consider a quality 1,000W supply. Enter the XTR 1,050W. The XTR range encompasses supplies from 550W right through to 1,250W, and all have 80 PLUS Gold certification, fully-modular cabling, a hybrid fan mode and, through Easylink, the ability to supply adequate voltage to any number of components irrespective of whether the supply is single- or multi-rail. You may be forgiven for thinking this is the best XFX has to offer, but that is not the case. The company also has a single XTS model with Platinum-rated efficiency. Adding that extra morsel of efficiency increases the price by about 10 per cent, to £125, mind. 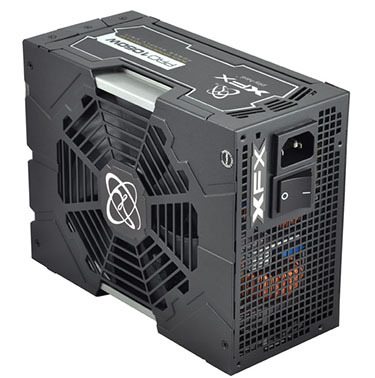 XFX uses a very distinct chassis for its premium PSUs. With more cutouts and angles than most bog-standard supplies, this one stands out, and it's an aesthetic that XFX has been using for about four years now. Case measurements of 170mm depth and 150mm width ensure it'll fit into a wide range of enthusiast chassis, while a 135mm fan has a maximum throughput of 94CFM. The fan remains off until the load hits 25 per cent (262W) or if temperature exceeds 25°C. Rival manufacturers who retail similar supplies are more bullish about the quiet-running capabilities of their PSUs, often with the fan remaining off until 40 per cent load has been reached. Like most, the warranty is a reasonable five years. The fully-modular ports are clearly visible on the front. XFX says that its supplies are potentially more efficient than rivals because it doesn't use a daughtercard between the main platform and outside wiring. This direct-to-connector feature is called SolidLink. Remember that hybrid fan? There's a small switch on the front that toggles the supply between an always-on and hybrid-fan mode. We can't see any reason not to use it - it's a feature, after all - though the option is there to have the fan running at all times. Those reasonably new to the PSU game rarely manufacture supplies themselves. 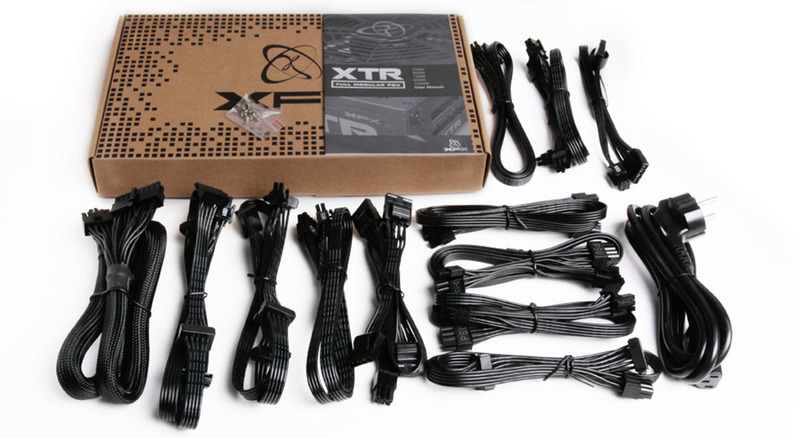 XFX struck up a partnership with highly-regarded OEM-maker Seasonic to deliver the various XTR supplies. Understanding the provenance lends further support to it being a top-tier performer; Seasonic rarely does a poor PSU. Cables-wise, the 1,050W model has reasonably generous lengths and connectors. The main 24-pin measures 610mm, the dual CPU 8-pin 650mm and four PCIe (two 6+2-pin connectors on each) at 550mm extending to 650mm. All told there are eight PCIe, 12 SATA, six peripheral and a solitary floppy running off the Molex peripheral. The choice and number of connectors is good. The all-black look is nice and the flattened nature of all bar the main 24-pin ATX makes them easier than normal to route through your case. It would help if the cable plugs were colour-coordinated for easier installation, however. XFX is clearly aiming for the premium end of the market but the overall bundle is rather perfunctory - there are no Velcro straps, ties or bags that we commonly see on other supplies. It's no deal-breaker, we suppose, yet take a look at, say, a be quiet! bundle and the difference is apparent. We can't argue with the quality of the XTR's output. Being able to push almost all of the wattage down the throat of the 12V line is great, and a 50°C ambient rating highlights the quality of the supply in an indirect way.